Sustainable nanomesh; beyond 5G; photonics device. Imec collaborated with KU Leuven to develop a nanomesh material made of a 3D structure with nanowires. This material could prove to make batteries more energy-efficient, while also improving catalytic converters and fuel cells, and making hydrogen production easier. 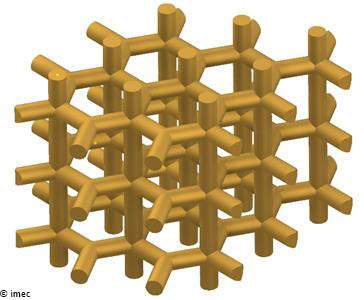 The research team is touting the 3D nanometer-scale metal grid structure with highly regular internal dimensions as a way to make industrial products more environmentally sustainable. The material can be inexpensively manufactured through anodization and electroplating processes, according to the team. First, a mold is formed by anodization of aluminum foil. The secret for the regular perforation at the nanoscale lays in the controlled doping of the aluminum metal. The resulting structure acts as a mold in which a large variety of materials can be deposited. After consecutive chemical etching, the mold is being dissolved and a self-standing nanomesh structure remains. On a macroscopic level, the self-standing nanomesh is a flexible foil, giving it another edge over its closest competitors (metal foams and aerogels), which are often more rigid or brittle. There’s a lot of chatter and hype about fifth-generation cellular communications, widely known as 5G. Researchers at Carnegie Mellon University’s Department of Electrical and Computer Engineering are already looking beyond the nascent 5G technology. Professor Jeyanandh Paramesh and his students designed a microchip meant to support the post-5G networks of the future. They presented a paper on the chip design at the 2019 International Solid-State Circuits Conference, held last month in San Francisco. The team came up with an advanced millimeter-wave frequency chip for multiple-input-multiple-output (MIMO), for simultaneous transmission of multiple data streams. The chip is said to have a highly reconfigurable, bidirectional architecture, enabling the device to transmit or receive signals across a range of frequencies employing a variety of signaling mechanisms. The chip also supports full-duplex beamforming. A well-funded startup in Sunnyvale, Calif., Kumu Networks, has been working on full-duplex wireless communication for several years, based on research done at Stanford University. The company is perfecting self-interference cancellation technology. Researchers at Yale University created a device that combines mechanical vibration and optical fields for greater control of light particles. They say their device has demonstrated an efficient on-chip shaping of photons enabled by nanomechanics driven by microwave frequencies. The research team is led by Hong Tang, the Llewellyn West Jones, Jr., Professor of Electrical Engineering, Applied Physics & Physics. The team published the results of their work in the Nature Photonics journal. Instead of resorting to the usual nonlinear optical effects to manipulate photon frequency with a strong laser, the Yale team’s device has a series of waveguides, through which microwaves are directed. Light and microwave are sent through the device, and the light wends its way through alternating suspended and clamped waveguides on a single chip. This creates a positive and negative effect, corresponding to the microwave, which always has a positive and a negative component. The light spirals in each of the waveguides to prolong the interaction and maximize efficiency.